Growing up, I never put coleslaw on any foods. I had never had the coleslaw homemade, only from the deli counter at the grocery store. It was always runny and unappetizing and I never cared for it. When I moved to West Virginia I was taken aback by the fact that everyone in this area put coleslaw on their hot dogs. I was very skeptical at first and was reluctant to try it for some time. Then I met my husband, who is obsessed with hot dogs and came around to trying it. I must say that homemade coleslaw is in no way the same as the runny store bought variety from back home in Seattle. My boys are now growing up in a household that always has coleslaw when I serve hot dogs or BBQ, and I'm okay with that. I have been bad recently about relying on the store bought varieties that are available locally, which are so much better than the stuff back in Seattle! When I saw a recipe for Classic Coleslaw Dressing in the July issue of Bon Appetit magazine I figured it was about time I started making more coleslaw from scratch. This recipe has 9 ingredients for the dressing (and then cabbage of course). The dressing takes only minutes to prepare and the ingredients were all easily found at my local grocery store. I used homemade dill pickles and brine, which I had made a couple of months back. I followed the remainder of the recipe as written. I only used straight cabbage for the slaw, I didn't add carrots or any other vegetables. A couple of years back I lost the Julienne slicer that I used to use to shred cabbage, Since that time I have been doing my shredding by hand. which leads to slightly larger shreds. I have the attachment for my food processor, but I have yet to use it, maybe I'll learn this winter. Due to shredding with a knife, my coleslaw had extra sauce, which I don't think would have been there if the cabbage pieces were uniform. The size of the pieces in no way detracted from the taste, just something to note if you are shredding by hand. This recipe went well with the Pulled Chicken Sandwiches and I had enough leftovers to use again on re-heated Lexington Pulled Pork. 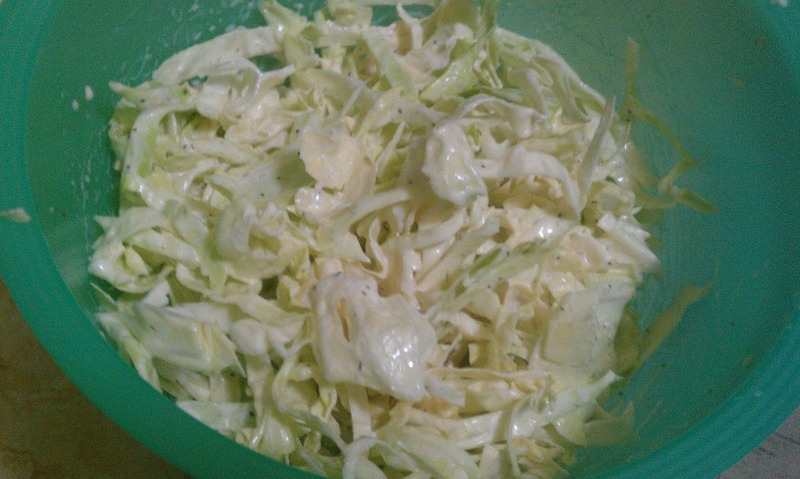 A great simple and straightforward coleslaw recipe. For the recipe go to Bon Appetit Classic Coleslaw Dressing. I'm following you back. Love the idea of a place to find good food recipes that might work for my budget. Thanks for linking up to Tasty Thursdays!